Drip pans keep your drum storage areas clean and safe. Each industrial drip pan will hold over one half a gallon of liquid. Very economical because you replace them less often. Logical application is under drum spicket but are very efficient and cost effective to use under machines or hydraulic hoses. 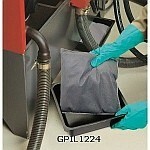 Use drip trays for oil anywhere you have a high volume of leakage that is too much for absorbent pads. Great solution for all areas where you have large amount of leakage. 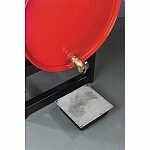 We carry two types of drip pans. 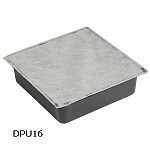 The DPU-16 is a universal absorbent pan with a rip resistant polypropylene cover that keeps the absorbent filler and absorbed liquids in the pad. With this model you replace the entire tray. Our other model comes with a pillow pan where you can easily replace the absorbent pillows as needed. This industrial drip pan can be purchased with universal pillows that absorb all liquids or with oil only pillows that absorb hydrocarbons only and repels water based liquids. Review areas where you are now using absorbent pads to see if you can save on absorbent costs by using drip trays for oil because they hold more fluid.